This long-time full-size SUV rivalry is heating up. 2019 Chevrolet Tahoe vs. 2019 Chevrolet Suburban: What's the Difference? These SUVs have a lot in common, but there are a couple key differences. The 2019 Chevrolet Tahoe has been serving big families with big needs for decades, and it looks to continue doing so for years to come. 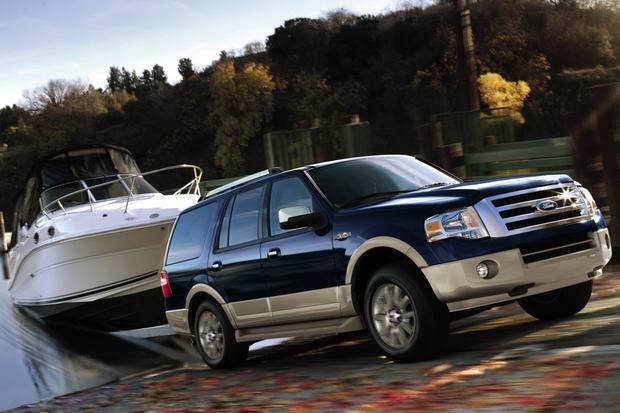 2007-2014 Chevrolet Tahoe vs. 2007-2014 Ford Expedition: Which Is Better? We're comparing two used full-size SUVs -- the 2007-2014 Chevrolet Tahoe and the 2007-2014 Ford Expedition -- to find out which is better. The top-selling 2015 Chevrolet Tahoe full-size SUV is all-new, with more power, upgraded infotainment and a long list of safety systems. When it comes to moving big families with big toys in tow, the 2015 Chevrolet Tahoe has the right stuff to get the job done. Completely overhauled from the ground up, the 2015 Tahoe offers more of what Americans have come to expect from a full-size SUV and tosses in a few surprises for good measure. Of course, it doesn't hurt that SUVs such as the Ford Expedition, Toyota Sequoia and Nissan Armada are beginning to show their age, giving the all-new Tahoe another distinct advantage over its competition. Although the Tahoe has been given a new skin, interior and suspension, its basic platform and premise remain unchanged. The Tahoe is a mammoth cruiser, big in all dimensions, and when equipped with the optional 40/20/40 front bench seat, is capable of carrying up to nine passengers. That said, it should be noted that the Tahoe's third-row seat is not as accommodating as some larger SUVs such as the Suburban or Ford Expedition EL. The Tahoe's body-on-frame architecture may seem outdated to some, but it allows for heavy towing and off-road roughhousing, while the massive cabin makes room for copious amounts of people or cargo. Like previous Tahoes, the tall floor means a tall step up, prompting us to recommend the optional side steps. 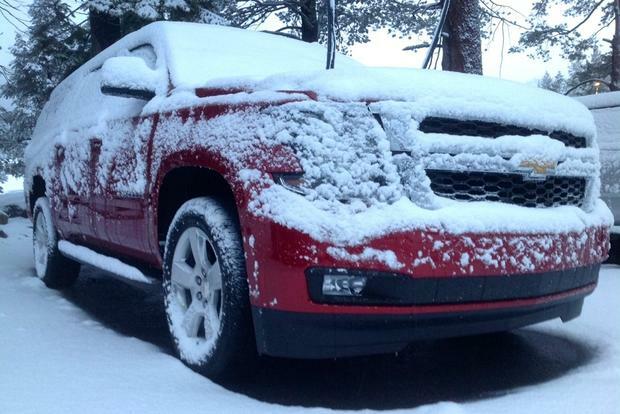 We think highly of the Tahoe's new look. It's rugged and sleek without the need for cartoonish embellishment or overly ornate body cladding. Under that sleek new skin is a significantly rigid, fully boxed frame made of hydroformed rails (a process that produces a stronger frame that's less prone to bending and flexing over time), high-strength steel and numerous isolators to help reduce vibration and noise. Chevrolet's Magnetic Ride Control is now standard on the pricey LTZ trim. It uses magnetically adjustable fluid-filled shocks to compensate for any road (or off-road) condition. Compared to the lesser trims with their coil spring and traditional shocks, the improvement in the LTZ's ride quality is noticeable. Inside, the Tahoe takes the family hauler to new heights of luxury and creature comforts. The materials used to form the cabin are of the highest quality, with numerous soft-touch surfaces, intricate detailing and clever packaging. There's more front-seat legroom, and headroom is up, too. Unfortunately, the Tahoe retains an annoyingly high cargo floor created by the inability of its third-row seats to fold flush into the floor (blame the solid rear-axle design). Those third-row seats were sort of the Achilles heel of the previous Tahoe. They were removable but heavy, and they sat up very high when folded, taking up precious cargo space. This time around, Chevy managed to get the seat backs to fold flat on top of the seat bottoms like before, but those seats now sit at a lower point when completely folded. Still, they don't fold flat into the floor like other SUVs. To give the benefits of a fold-flat cargo area, they've inserted a plastic riser that brings the floor up to the same height as those folded seats. It does offer some added cargo carrying ability as that insert opens to allow for a sort of interior "trunk." It seems perfect for storing things you don't want to slide around too much or stuff you need only once in awhile. Still, it's not a very elegant solution and does not seem like something you'd expect to find on a car or truck that costs $50,000 or more. This insert also helps explain the high load floor mentioned earlier. When in place, the third-row seatback is also fixed in a rather upright position that some might find uncomfortable on long trips. Obviously, most of the better equipment is reserved for the top-of-the-line LTZ trim, but even the base LS can be equipped with the Driver Alert Package that includes power adjustable pedals, forward-collision alert, lane-departure warning and the cool Safety Alert Driver's Seat that vibrates to warn drivers of potential hazards nearing the vehicle. 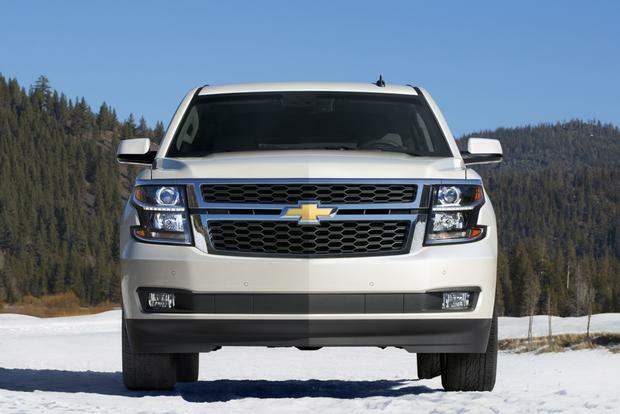 While the 2015 Chevrolet Tahoe uses the same 5.3-liter V8 from the 2014 model, improvements this year help make it one of the most powerful and efficient engines in its class. With 355 horsepower and 383 lb-ft of torque, there isn't much that the Tahoe's V8 can't tackle. Cylinder-deactivation technology helps conserve fuel when cruising, allowing the Tahoe to earn an Environmental Protection Agency-estimated 16 miles per gallon in the city and 23 mpg on the highway. Four-wheel-drive models achieve the same city economy and only one mile less on the highway. When properly equipped, the Tahoe can tow up to 8,500 pounds. 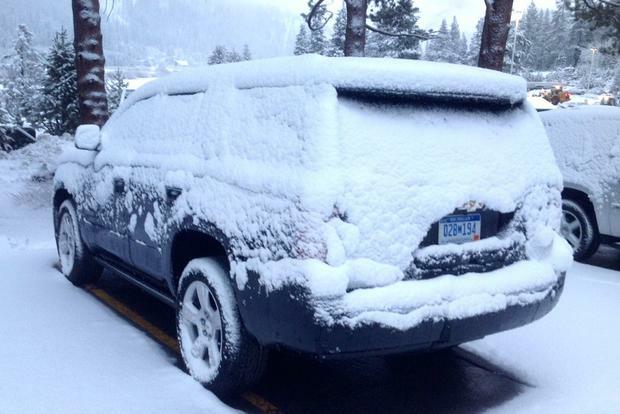 On the road, we found that the big Tahoe handled remarkably well. The steering is precise and has just enough assist to allow easy maneuvers without negating feedback. 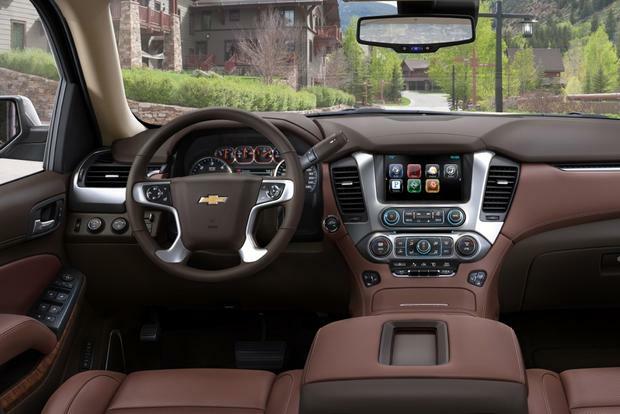 The Tahoe is extremely quiet inside, and its ride is comfortable and controlled. During our test drive, we encountered a blizzard, which allowed us to fully utilize the all-wheel-drive system along with the numerous electronic aids, such as lane-departure warning and the Safety Alert Driver's Seat. 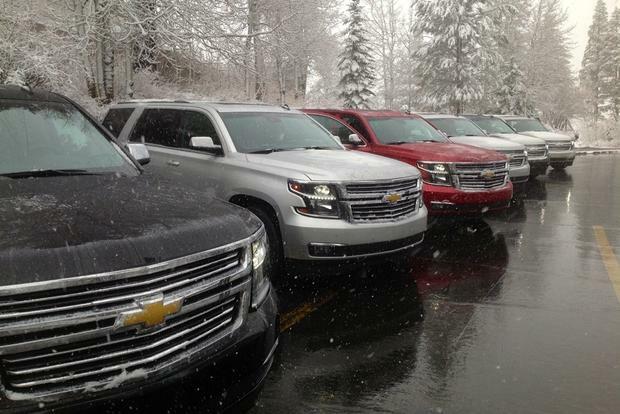 In whiteout conditions, the Tahoe's numerous electronic nannies went a long way toward calming otherwise frayed nerves. Yes, the new Tahoe is beautifully detailed and well-equipped, but it doesn't come cheap. Even the most basic LS trim tips the $45,000 mark. Spring for a loaded AWD LTZ including navigation, infotainment, leather seating, Bose audio, a power-folding third-row seat, a rear-seat DVD/Blu-ray player, MyLink, adaptive cruise control, heated/cooled front seats, a heated steering wheel, heated second-row seats and a power rear lift gate, and the sticker reaches an eye-popping $72,000. 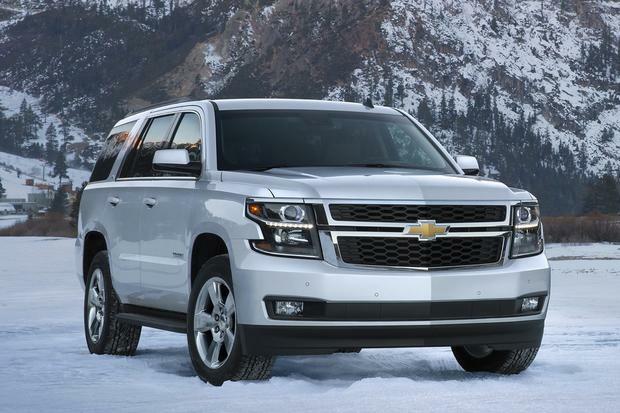 Still, for big families with big needs, it's hard to top the Tahoe. Then again, if you don't need the V8 power and towing capability, you can save a lot of money and gas opting for a slightly smaller crossover SUV such as the Chevrolet Traverse.